The 2019 FTE is new and will be an amazing experience that is a huge step up from 2018, which as in previous years was a huge step up from 2017! You should look at the details below and see if it resonates with you. We are looking for a certain type of trainer (driven, kind, relaxed and patient, but lively and able to communicate!). It will be these traits we transform into an industry leading trainer using our course content and connections around the industry. ONLINE – Delivered by Zoom conferencing and HiveLearning, a mixture of online material and live discussions. A task and lecture every two weeks. Being a Personal Trainer, Therapist, Sports Performance coach or any other movement-based job can be the most rewarding job you can choose. To give back means so much to a client and can be so rewarding as a person, way above the money you can earn and the places you can see. Initially, the job feels hard, and then you find your feet and start to do great things with clients, and get some great experiences back. The problem is that the job can become stale, it starts to feel repetitive and it makes you want to search for more. At this point, people start to seek out education to try and broaden what they can offer, to try and do better for their clients and to try and meet different people in our industry. This is the step that needs to be considered carefully, especially if you are reading this with years of experience under your belt. Do you re-train completely, or do you upskill? Could you start teaching what you know to others? The questions start to get deep. If you chose a course will you learn that you do not actually know anything? This is more than tough, it can stop people from taking a course altogether. Perhaps you do not need the course? It is probably just a flutter, and you are happy with what you deliver. You realise that there is a lot more you could do for your clients, but they get enough and you get by. The dilemma is this, do you want to change, do you want to open up to the possibilities, or are you going happier living inside a comfortable zone where you are valuable and do help. What would be the risk, you think? Could other trainers take my business, will I miss out as the industry develops? As you weigh this up, you are also thinking about your business. How will this operate with the stress of learning, but without the learning will you be able to grow your business? Could you charge more without significant delivery, is there enough streams of income, will this life be the one that allows you to do the cool holidays with your family or the trips and nights out that help you find a family? If you want to increase your potential streams of income, offer your clients more and from a place where you have done the work to find the information and you find the idea of connecting with a group of like-minded industry leaders something appealing, not just for a year but for the rest of your time in the industry, then you should read on. If not, then we know you are doing a great job and when you are ready you should come back and read on. The FTE is designed for the industry expert who is thinking long-term, who needs a push now and again, but at the same time has the drive to become the best they can be. It is this choice that will connect you to a group of supportive, passionate, sometimes aggressively so, caring, loving, and driven trainers who strive to improve themselves and the industry. Making this choice is a brave one, but it is a one payment access to continuous returns and upgraded learning, where every year the course gets better, the group gets more supportive and the opportunities grow for our trainers. 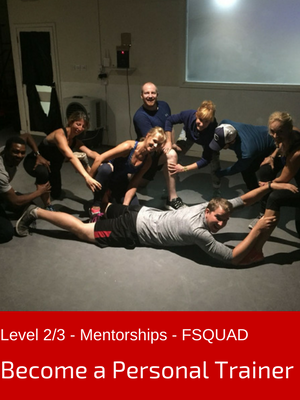 Once you have booked on to the FTE, you get access to our group, even before the year starts. The content is available and always growing, which might make it seem overwhelming. The trainers will instantly put their arm around you, take an interest in what you do, offer feedback on your social media posts and the way you train people. Never giving you the answer, but helping you define and ultimately answer your question. It is a tough choice and you will work hard and have some emotional ups and downs if you commit, however, the ultimate reward of the group, seeing yourself grow in confidence, knowledge and industry connections far outweighs any hardship. For those of you who fend off the offers of becoming an instant expert, who want you to blindly follow the guru, who promise different and mean made up, who offer research but forget to mention that it is inconsistent and who want you to become clones of the guru rather than an expert in your own right, then the FTE is about to deliver something that is hard to list. FTE is less of a course and more of entering a new universe (blame the Marvel influence!). 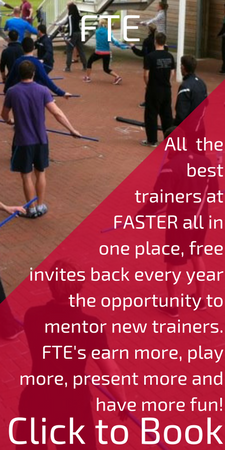 We run 8 days of live training each year, split into two 4 day get-togethers. Each year is built on the same fundamentals, and yet each year is different and evolved. We open the gates to the course each year, but you only pay for the course once and get to come back as much as you want to. More than that, we want you back and encourage you to return. The course is built to allow you to teach the FASTER courses to other students, as a mentor, showing your version of how to answer the questions in the route that FASTER has designed. It means that you get the extra income, but more importantly, you will raise the industries impression of you, and most importantly you will be helping other trainers to become better at helping their clients. It means your impact on the industry will be far higher than most get to experience.